HomeLifestyleIs marathon running bad for you? April 21, 2018 Paul Lifestyle Comments Off on Is marathon running bad for you? 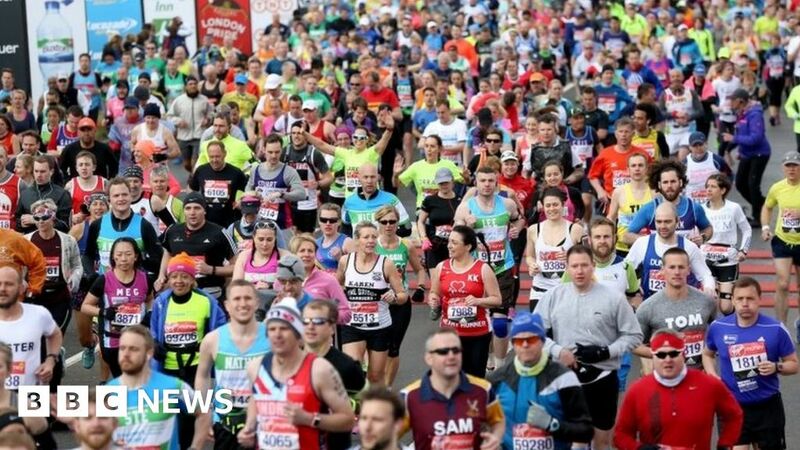 On Sunday some 40,000 runners are due to take part in the London Marathon. But can marathon running do more harm than good? Barry Trott, 57, was nearing the end of his first marathon in Bilbao, Spain, in 2014, when his dehydration turned into sudden sickness. With only a few miles left to the finish line, Barry, from Bognor Regis, in Sussex, collapsed suddenly and started vomiting. He soon found himself surrounded by paramedics, his race over. “I thought there must be some warning signs that say, ‘Stop,’ before you get to that point – but there wasn’t. I didn’t see it coming,” he said. In contrast, Sophie Everett, from Chester, was able to finish her first marathon, in Chester in 2013, despite feeling a nagging, “knife-like pain” in her feet. But weeks later the pain had not left and she was diagnosed with plantar fasciitis – a chronic injury to the foot and heel. So were these unlucky experiences or are marathons actually risky for our health? Marathons are a “massive physical challenge” for our bodies, says Dr Mark Lake, a sports scientist at Liverpool John Moores University who studies how movement affects the tissues of the body, such as muscles, bones, tendons and ligaments. Even in regular runners they fatigue the body to “the verge of being at risk of damage” and take weeks to recover from, he says. Doing them requires fitness and conditioning throughout the body. But if this is built up too quickly over-use injuries, such as shin splints or stress fractures, can occur. “You have to allow the body to adapt to it,” Dr Lake says. That is because these factors combined cause greater, more uneven impact on our joints. “The most at risk person would tick those three boxes: they’re overweight, dramatically increase their training to cope [with doing a marathon] and have some issue with how their body is aligned,” Dr Lake says. But what about for people who take the time to prepare properly – do those miles not invariably take a toll on things such as our joints and other parts of the body? “As part of the adaptation process, you would obviously benefit,” he says. In a hard race on a hot and humid day, marathon runners can lose up to four litres (seven pints) of fluid through sweating and exhalation. This puts them at risk of dehydration and hyperthermia, where the body’s temperature is greatly above normal. “Most of the collapses you’ll see on Sunday will be associated with over-heating,” Greg Whyte, professor of sports science at Liverpool John Moores University says. To prevent this runners should keep properly hydrated by drinking “little, often and early”, he says. Some experts warn against taking on too much liquid, because in extreme cases it can lead to water intoxication, a potentially fatal condition. Prof Whyte said this was “very uncommon” and people were far more likely to end up dehydrated. “The primary way we combat this [over-heating] is through evaporative sweat loss, which requires fluids,” he adds. Stomach cramps and diarrhoea can also strike during marathons because of how long-distance running can disrupt digestion. This can happen to people who have carbohydrate drinks or gels for the first time during a marathon, Dr Stephen Mears, a lecturer in sports and exercise nutrition at Loughborough University says. He says those who plan to take these during a marathon should first practise taking them under race conditions to see how their bodies react. In some cases people have died during marathons, but deaths of marathon runners are extremely rare. US research previously looked at nearly 11 million runners who participated in marathons or half-marathons between 2000 and 2010. Over the decade, 59 of the runners had a cardiac arrest – where the heart stops working – and 42 of these people died. Dr David Oxborough, who has studied how marathons affect the heart, says when deaths during marathons do happen they tend to occur in people who had undiagnosed heart problems, either in older people or in those with inherited conditions. “You’re exercising, you are putting your heart under strain, and therefore if it is compromised in some degree it could potentially cause you to have a cardiac event,” he says. While these deaths are rare, Dr Oxborough says they underscore why it is important for people to get a health check-up from a doctor before doing a marathon. So are marathons bad for us? While marathons are a big challenge for our bodies, ultimately any of the health risks are more than outweighed by the benefits, experts say. “There’s no doubt if you undergo all of that hard work to gradually condition your body you’re going to benefit, without a shadow of a doubt,” Dr Lake says. But experts say the key, particularly for inexperienced runners, is to not do too much too soon, follow a good training plan, and “listen to your body”. “If you haven’t done any running for a while you need to go out and see how far you can go for a long walk first,” Dr Lake adds. Sophie Everett has not run since her first and last marathon because of the ongoing pain in her feet, but Barry Trott has since gone on to complete several marathons. He said it was the “personal challenge” of marathon running that motivated him to do more. “I can run another distance and skive off the training and get around and it wouldn’t be too bad, but if you don’t do it properly for a marathon it’s horrific.